First off, wonderful readers, I would like to apologize for the astonishing lack of updates on this blog and on this website in general. The last two years have been a whirlwind of changes on both a personal and professional level. Since the last post in March of 2016, I have earned my doctorate degree, presented the Seafoam dress at ITAA and won a major award for it, completed a 3rd project in the Tribute to the Oregon Coast series, moved from teaching at Mount Mary University to now teaching at my alma mater Framingham State University, and am now living in a house that I am renting to own! The most recent exciting news is that this Earth Day, April 22, 2019 I will be having a solo exhibition of my Tribute to the Oregon Coast garments on display at the Henry Whittemore Library on the FSU campus. The exhibition will open with a reception and a talk I will be giving on creative scholarship and my process on creating the garments. This exhibition will also showcase the fourth and final garment in the series: Vegetation! The concept for the Vegetation project has been something I have had in mind since the beginning of the series. When I used to spend time out in Newport and Yachats, Oregon and on the shores of Orcas Island up in Washington State, the coastline would often be littered with various washed up seaweed and kelp species from the area. The waves would often tangle the long stems and leaves into piles along the shore. After laying out in the sun for hour they would start to smell and dry out. I always thought the pieces had an interesting texture and shape, and the tangled up piles were fun to poke with sticks! While these were interesting on the surface, the kelp along the coastline has a number of uses and benefits to the ecological landscape. As seen in the articles linked above, the kelp can be harvested and used for pickling , and according to the third article, could be used to help regulate the acidification that is effecting the oyster population along the entire Pacific coast. With these benefits in mind, I found it appropriate to end the series with designing a garment that would aid in bringing awareness to a more positive environmental phenomena. My very early sketches of this concept were very literal—like making a gigantic bullwhip kelp as a dress. Structurally this could be interesting, but I was having difficulty finding workable fabrics with the color and texture that looked the most like the kelp and would work well with the shape. I played with this concept for months, but never felt the spark of inspiration to move forward on testing these designs out. The second one seriously just gives me tennis ball vibes. Yikes! I lost steam with this project until February when I stumbled upon a really unique leather hide in a small fabric shop in New York City during a school field trip. I admit that I find working with leather very daunting. I’ve never made anything but small accessories from leather, and the price usually scares me off. I did love the color and texture of this hide though, so I took a picture and left it in the store. I thought about that leather for months. I had serious buyers regret. I could not find anything quite like it anywhere locally. I took another trip out to NYC in May and went on a wild goose chase trying to track down the same store and amazingly the leather hide was still there! I could not leave without it. It turned out to be the most money I’ve ever spend on a single fabric purchase but I think it is absolutely perfect for this project. That being said, I now finally have to face my fear of cutting into it! I jumped back into this project reinvigorated to try all new territory. 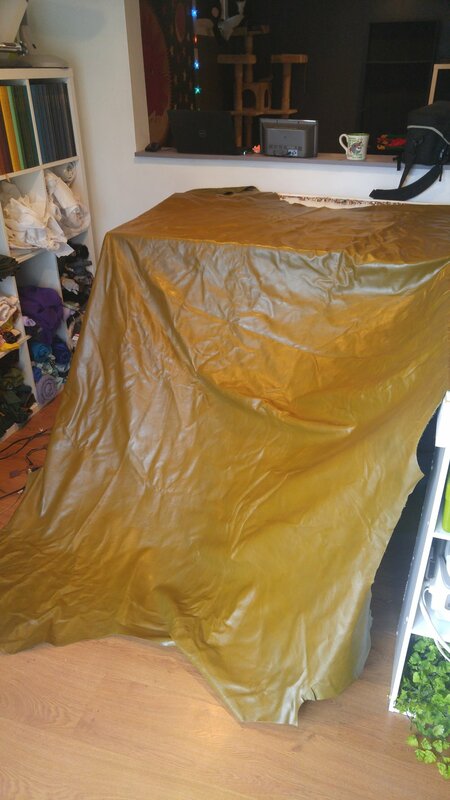 Sewing in leather was one hurdle I would have to jump, so why not give myself a few more? So I am going to make this piece a menswear project! I have yet to make a non-cosplay specific menswear piece. In contrast to some of my earlier creative scholarship, I am also aiming to make this more of a wearable piece with elements that could be worn separately in everyday life. I am going to be fitting this garment to a very special friend of mine, and he is serving as a muse for this project. 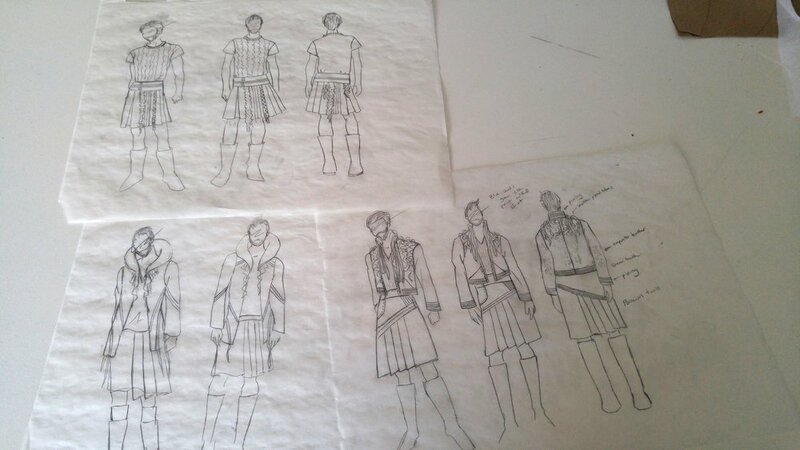 I am aiming to create a three piece look for this project: a leather jacket, digitally printed shirt, and modern kilt. My model enjoys wearing kilts, and finds them easy to wear and style with many types of other garments. My hope is that he can incorporate this piece into his wardrobe. I’d like to share some of the journaling and brainstorming I’ve been doing over the past few weeks. Whenever I start a new project like this I like to quickly sketch many different ideas, jot notes, and figure out specific embellishment techniques that would work well with my intended design. For this project I am considering trapunto, cording, and heat forming techniques on the leather. I cut a small section of the hide and practiced with a few different techniques. 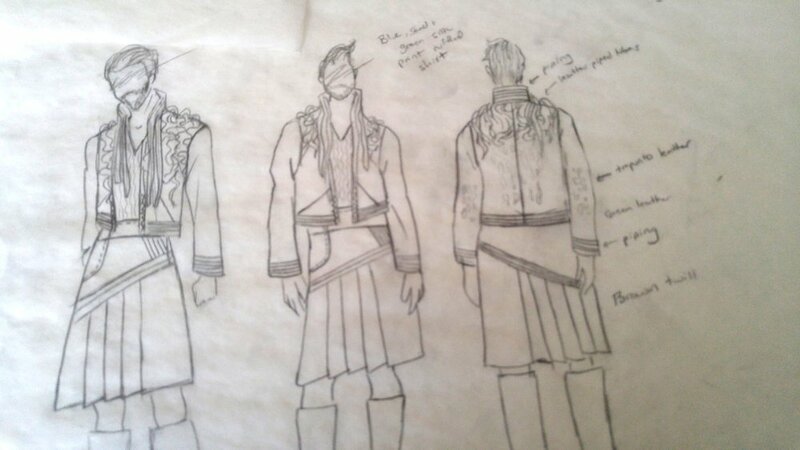 I am heavily leaning towards the design in the third and fourth images, as I like the balance of the embellishments on the coat with the shirt and kilt. I have much, much more to go on this project, but I am hoping to make considerable progress over the next few weeks. I have already created a print and had a swatch sent from Spoonflower. The colors are not to my liking so I am going to try a couple more varients before I settle on a final design. You can look forward to seeing that in the next post! Thanks for reading and I’d love to hear your feedback on what I am working with so far!